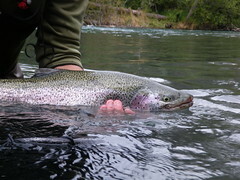 It's Fall in Alaska, that can only mean one thing to me, Big Fat Rainbows! 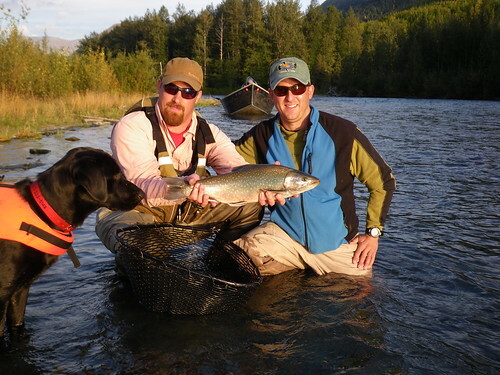 Fall is usually thought of as Big Brown time but up here in Alaska big Rainbows, Silvers and Dolly varden's reign supreme. The area we targeted was in the Chugash Mountain range surrounded by turquoise waters of the mighty Kenai river! It was time again for me to head back to Alaska and have my Pal Colin and Drifter show me where the fish were at and they absolutely did not disa[point. Another trip to remember for sure and besides incredible fishing we had immaculate weather, spectacular scenery and good friends to hang out with for a fun week of fishing! Cooper Landing was our stomping grounds for my trip and it's a place I'm starting to love more and more after repeat trips here. Cooper Landing was named for Joseph Cooper, who struck gold in Cooper Creek back in 1894; I think the luck carried over to our trip seeing how gold shined bright in these eyes! We floated the Middle Kenai one day in search of Monster Bows but came up a bit short due to some nocturnal Big Bows and a little congestion from boat traffic. Nonetheless I had a great day out and was lucky enough to get the only Coho of the day. Glad I did since dinner was pretty incredible with Fresh Salmon meat. Nothing like having fresh Salmon sushi an hour after being caught than again a few hours later for dinner! 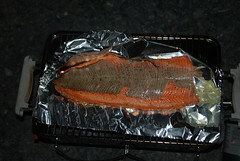 Fresh caught Salmon is something all visitor's to Alaska want to experience I was was the first to druel when Colin cooked up another great dinner and were had plenty to eat for everyone this night. Bears, yep we saw a few and most importantly none too up close compared to years passed when we got a real up and close encounter with a Brownie. 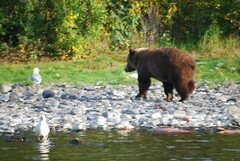 The Russian river area was a local favorite to bears and though we fished pretty close by, no bears were harmed in the making of this report! What's a good morning out we had almost every morning when we started out in the Kenai region, but especially the 2nd morning of our trip when a fog moved in around 7am at Skilak Lake. What an amazing place Skilak is to fish and I can't wait to get back for another shot at a 20lb Bow! Light traffic on this day to start out but things got a bit louder as the Holiday weekend wasn't quite over yet. We all managed to get some nice fish this day despite managing to lose some big 22-26" range Dolly's that took off and spit before getting close to the boat. I was fortunate to meet some other fishing pals in town for the week as well and boy did we have a good time together. It started with some friends of Colin's from Missouri who were here for 10 days -lucky dawgs, and decided to join us for the day out on the Kenai. Despite having 5 guys and Drifter aboard, we all made out okay with only a few lines crossing and plenty of fish caught. 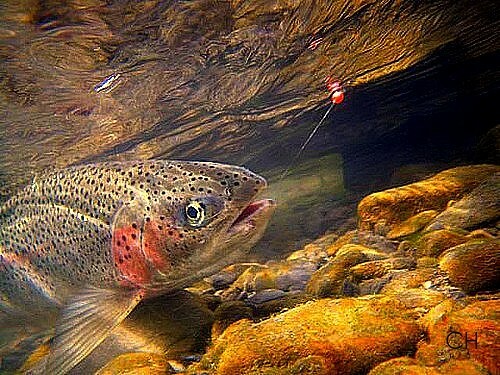 Lot's of jockeying going on each hole with those guys which was fun to watch and one gorgeous Dolly Varden showed early in the float to get our spirits pretty high. 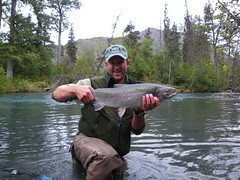 Very fun float day and some good guys that I'm sure we'll run across again to fish on my next Alaska adventure. Bob "NoCalBob" and his son Chris joined us on our 2nd day out and fished with us for a few days as well as provided some humor, Alaska fishing experience on the Middle, rowing and some much needed breaks in their Camper which we definitelty enjoyed having. 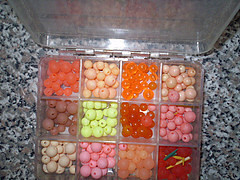 They also got into some nice fish along the way and provided some good food to snack on as well! 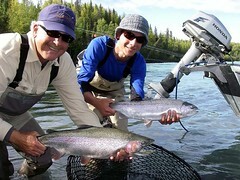 They knew the Kenai well and was definitely glad to have had them along for a few days to fish with us. Lot's of fishing stories to speak about from their home area San Jose and also some of their travels which hope to be more Saltwater it seems. 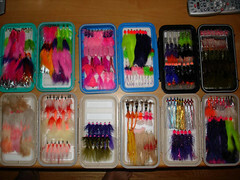 Can't wait to get over that way for some superb Striper fishing, Carp and possible Saltwater! Despite having a brand new Olympus camera to show off for some underwater shots on this trip it was Colin who took some incredible shots like these during our fishing adventure. Did I say new Olympus camera, I meant to say a Camera I purchased that decided on the 2nd day not to work due to taking water shots, yep that means it's not waterproof anymore. Oh well thanks to a 2nd camera I brought and Colin taking lot's of pictures all was not lost! Food of Choice...a few hundred leeches, flesh fly's and of course Eggs, Eggs, and more Eggs!! 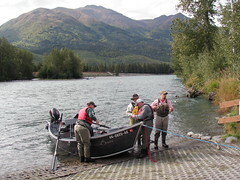 The Upper Kenai river is made up of roughly 17 miles of prime fly fishing water. Rafts and Drift boats can be found here around every bend and with that comes the restrictions for no motors and baitchuckers....my kind of water! 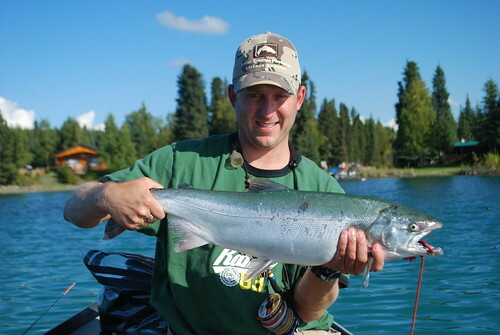 Many anglers chasing chasing red salmon are drawn to this popular area of the Kenai-Russian confluence for a chance at man of the Salmon that pass by in their 2 runs throughout the Summer months. 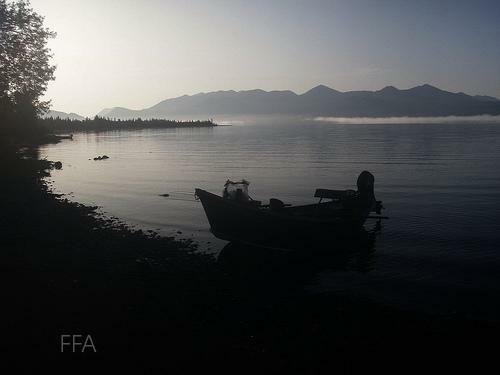 The 1st runs arrive around mid-june and the 2nd run usually around mid-july, than again it depends on how the Salmon feel and when the masses arrive. 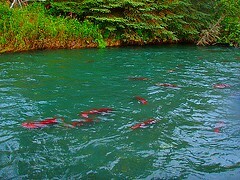 In the best years past roughly 150,000 red salmon pass through anglers on their way to spawn in the upper streches.